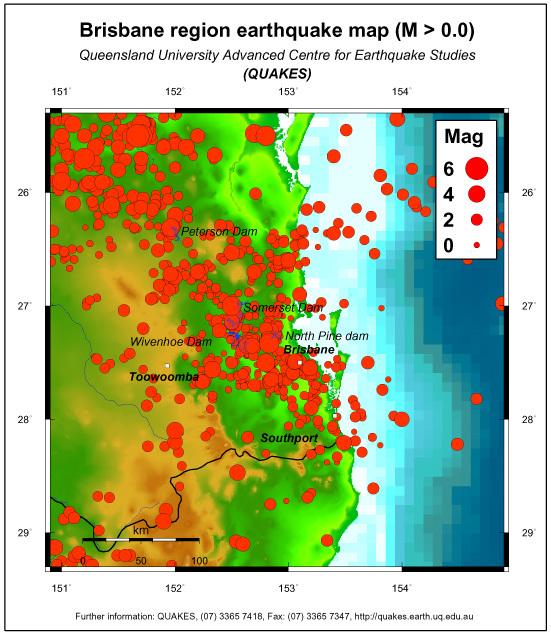 The Queensland catalog contains a total of 1369 earthquakes in the Brisbane map region. Shown here are Richter magnitude ML > 0 events. The map shows a high level of seismic activity spanning in a belt running through Brisbane and to the north and north-west. The Brisbane map region is one of the better monitored regions within Queensland due to almost continual operation of the Brisbane international station since 1935 and installation of a dam monitoring network around Wivenhoe dam since the late 70's. A reassessment of the earthquake hazard in Queensland conducted by QUAKES in 1996 suggested the South-East Queensland region running approximately from Brisbane to Gladstone was one of the higher hazard parts of the state although uncertainty remains significant due to data limitations. The small stand-alone Wivenhoe seismic network was upgraded recently by the dam agency (then South-east Queensland Water Board) for dam safety purposes and remains functional.